I'll start off by saying that today's topic is entirely out of my element. For this discussion to be useful, I'm counting on you, the reader, to share your knowledge. While I've studied Thoroughbred pedigrees my whole life, it's always been with racing in mind. But there's more to the Thoroughbred breed than racing on a flat track. Steeplechasing, national hunt or hunter/jumper sports, and dressage are all equine sports at which Thoroughbreds have typically excelled. Certainly, just as some bloodlines are geared for speed and others for stamina, there must be pedigree influences that are known for other, non-racing traits or abilities -- jumping, mental poise, durability, and so forth. Occasionally I'll hear something to the effect of "Dynaformer throws good steeplechasers" or "the Swaps sire line is still active in hunt breeding programs." And in my Is This a Broodmare? posts, someone often comments that a particular mare might have better success in a sport horse breeding program. So please share your insights. 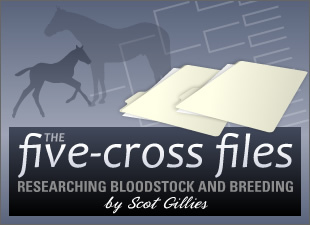 What bloodlines/sire lines/dam lines are prominent in another Thoroughbred sport in which you participate? What makes them a good match for the sport? Which racing bloodlines that are popular today would you like to see annexed into your non-racing sport of choice?